LOS ANGELES, CALIFORNIA (February 22, 2010) Soccer Nation Expo is an opportunity for team administrators, coaches and players to meet with manufacturers and vendors. 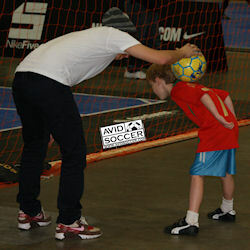 The conference features a full midway, coaching clinics, demonstrations, samples and a futsal tournament. When we started attending SNE several years ago, all of the major manufacturers were present. The event has shrunk over the past few years, both in the number of vendors and the number of visitors. Last year, there was no sign of Puma, adidas or UnderArmour. This year, there was no sign of Diadora, Xara and others. 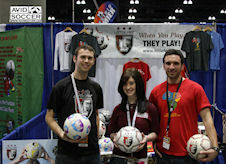 The expo has become a great showcase for small to midsized manufacturers and soccer specialty retailers. Companies like Calle Republic, Copa Cabana Beach Soccer and Reusch continue to make their presence known in their respective specialties. Calle Republic, in their 4th year, focuses on street soccer and uses the event to increase brand awareness and promotion partnerships. Copa Cabana is both a promotions company and an organization of beach soccer leagues/tournaments. They lead the beach soccer movement. Reusch is one of the premier innovators of goalkeeping. They produce a full range of gloves, apparel and accessories. Uniform manufacturers like Score, Protime Sports and Century also have the opportunity to meet with league and club administrators. These direct-to-consumer manufacturers along with soccer specific retailers use the event to connect with coaches, team administrators and league boards. It is an opportunity for buyers to compare uniforms side by side and set up deals. The real value is to small manufacturers. This year, we found a couple of note. The first is Little Feet. They are a socially responsible manufacturer with a great story. For every ball they sell, one is donated to a child in need. Another promising vendor was Cleatskins. The skins cover cleats (from almost any sport, not just soccer) for protection and stability off the pitch. Of course, the big underwriter is Nike. 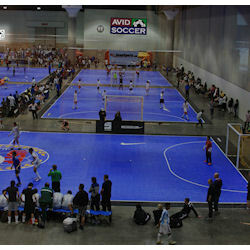 They sponsor the Nike 5 US Futsal Southwest Regional Championship. It takes place on fields on the convention floor. The action is fast and fun to watch. In addition, Nike has a shoe trial to allow visitors to try on the latest and greatest. It is a ways for Nike to connect directly with the players and give back to the community. We spoke to a number of different vendors. In general, the longtime vendors were there to support local stores or sales staff. Most felt that the cost of the show was high for the amount of direct sales they received, but it was an important to be seen and to support the local market. The new vendors were there for the exposure. It is a way to get their product in front of the soccer press and 30,000 soccer players, coaches and administrators.